To travel to Uganda is to enter the kingdom of the primates, as the country is known for being home to chimpanzees and gorillas, the main tourist attraction of any safari. The country has a variety of national parks declared national reserves with the intention of preserving the country's varied vegetation and the species that inhabit them, as some of them are in danger of extinction. 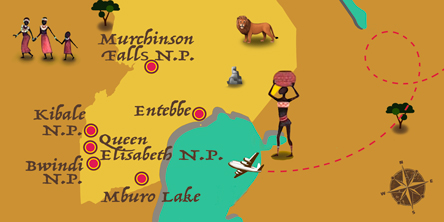 The best known is the Murchinson Falls, named for the popular waterfalls that are located in it. A boat trip on the White Nile allows you to enjoy waterfalls and aquatic animals such as crocodiles or hippos. As in the Kibale National Park, it is also possible to see the coveted Big Five: the buffalo, the rhinoceros, the leopard, the elephant, and the lion. The latter is usually seen resting on a tree branch in the Queen Elizabeth National Park. The largest primate reserve, however, is found in Kibale, where the chimpanzee is the most abundant of them all. The famous mountain gorillas are found in Bwindi, the impenetrable forest of thick vegetation that makes it impossible to pass many of its sections. In Uganda, most of the population is concentrated in Kampala, the capital of the country and one of the busiest cities where businesses and administrations are located. Formerly, during the British colonization, the commercial nucleus was in Entebbe, whose port was one of the most important in the country. Today, many of the excursions to the parks and the Ssese archipelago leave from here. Traveling to Uganda is to discover the richest plant diversity in Africa. If Uganda has caught your attention, leave us your number so we can call you to discuss the voyage that awaits you.